"An elegant electric grinder that can handle 200 lbs. per hour." This mid-ranged electric meat grinder is the right choice for many users who aren’t ready for a professional machine, but who will be grinding enough meat that hand-cranking is inconvenient. This includes a food pusher, three different-sized sausage attachments, as well as three different cutting plates, for coarse, medium and fine ground meat. It also has a detachable tray to hold the meat conveniently and non-slip rubber feet that keep the machine stable. A tomato juicer and vegetable shredder make this even more useful. A large button turns the machine on and off, so you can push it with the side of your hand, even if both hands are messy from handling the raw meat. This has an 800-watt motor and metal gears for powerful performance, a circuit breaker to protect from overheating and a reverse function to prevent jamming. The machine should be used for a maximum of ten minutes at a time for grinding (it'll need to rest for another ten minutes to cool down before grinding again). The working parts disassemble easily for complete cleaning and the cutting plates and blades are dishwasher safe. All other parts should be washed by hand. It should always be cleaned as soon as possible after grinding. If you’re looking for a meat grinder specifically for making kibbeh (a Middle Eastern dish, often made with minced lamb) this grinder will have you making your own kibbeh at home in no time. If you don’t know what kibbeh is, this grinder can grind meats for burgers or sausages (and you can experiment with kibbeh when you’re ready to try new things). This includes three cutting plates, one sausage attachment, one kibbeh attachment, one cutting blade, one food pusher and one hopper plate. It can handle up to 100 pounds of meat per hour, so it’s ready for some serious work, but it weighs a little less than 11 pounds, so it’s easy to move and store. This has an on-off switch with reverse to eliminate jams, as well as a circuit breaker to protect the motor from overheating. This is designed for quiet operation and for easy disassembly and cleaning. It should not be used for grinding hard foods such as nuts or fibrous foods such as ginger. The Sunmile Electric Meat Grinder is an elegant looking machine that can grind large portions of meat quickly and efficiently. Built with a metal gearbox with large durable gears and a large capacity tray and grinding head, you’ll be able to feed this continuously—whether you’re grinding meat for burgers or stuffing sausages to stock the freezer. This includes one cutting blade, three grinding plates, a plastic pusher, and three sausage stuffers, so you can make a variety of sausages and ground meats. The grinder head is made from polished aluminum, so you can chill it in the refrigerator or freezer before grinding to help keep the meat cold as you work. The cutting blade and grinding plates are made from stainless steel, so they can also be chilled. This operates with simple switches for on, off/reverse, and to reset the circuit breaker that protects it from overheating. The cord tucks neatly inside the machine for compact storage. If you’re looking for a budget-priced meat grinder, this model is great for smaller batches and is simple to use when you want to grind your own meat, vegetables, garlic, or even make homemade sausage. The base is plastic but it has sharp stainless steel blades. When you’re done grinding meat, this can be used for making rigatoni or spaghetti pasta. It can also be used for crushing nuts for garnishes or recipes, so you’ll find plenty of uses for it in your kitchen. To keep this stable during grinding, it has a suction cup base so it won’t move or wobble while you crank. This includes fine and coarse grinding plates, two stainless steel screens, and three sausage funnels. The base should not be immersed in water, but all other parts are dishwasher safe for easy cleaning. 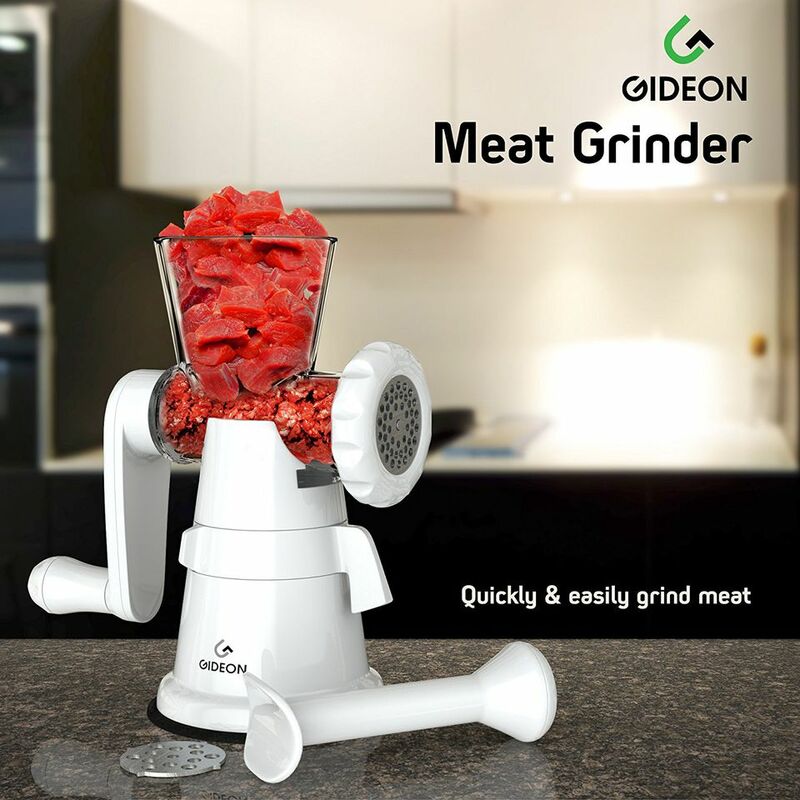 If you aren’t sure if grinding your own meat makes sense, or if you know you’ll only be grinding small amounts, this manual grinder is just what you need. It’s designed to be easier to crank than old-style metal grinders (and it takes less storage space). This has a suction cup base, so you don’t need to find an edge for a clamp. When you’re done grinding, just turn the knob to release the suction. The grinder comes apart easily for cleaning. Even better, most of the parts are dishwasher safe. Since it’s not electric, you can use it anywhere, even outdoors, when you’re grinding something messy. This has two stainless steel plates for coarse or fine grinding, and can puree vegetables for soups or sauces. The fine plate can even be used for mincing garlic when you need a whole lot of garlic. It also includes a pusher. If you have a KitchenAid stand mixer, it might make sense to get a meat grinder attachment rather than buying a stand-alone grinder. Like other attachments for the stand mixer, this attaches to the power hub and uses the mixer’s power to grind the meat. This has a fine plate and coarse plate, so it can be used for grinding meats, dried bread, as well as firm fruits, vegetables and cheeses. Most parts are dishwasher-safe for easy cleaning. It also includes a meat pusher, which has a wrench on the opposite end for unscrewing the ring that holds the plates in place. While this is all you need for grinding meat, there are add-ons that work with this grinder that make it even more useful. An optional food tray (Buy on Amazon) expands the surface area for holding food at the top of the grinder, making it faster and easier to keep feeding food into the grinder. An optional sausage stuffer attachment (Buy on Amazon) works with the grinder to feed the prepared sausage mix into casings. It includes both a narrow tube that’s ideal for breakfast sausages, as well as a large tube for bratwurst, Italian sausage and other large sausages. If you buy meat in bulk, you go hunting, or you want to take up sausage making as a hobby, this grinder can handle pretty much anything you throw into it—and it has the power for frequent use. The powerful 300-watt motor quickly grinds up to 3 pounds per minute, so you'll be done with big projects in no time at all. The brushed stainless steel housing is durable, and this product includes two cutting plates for medium and coarse thickness, plus two sausage attachments for breakfast links and regular sausages—along with a reverse feature which makes operation as simple as can be. Reviewers praise this high-quality grinder for being able to make family favorites like burgers, meatloaf, sausages, and chili with ease. Reviewers also love how easy it is to operate and clean.